4. Department of Gastrointestinal Surgery, the First Affiliated Hospital, Sun Yat-sen University, Guangzhou, Province Guangdong, P.R. China. Tumor is one of the principal diseases that seriously threaten human health. Insight into sensitive cancer markers may open a new avenue for the early diagnosis and treatment of this disease. CTHRC1 has been identified as a cancer-related gene. It is a secretory glycoprotein that possesses multidimensional roles associated with wound repair, bone remodeling, hepatocytes fibrosis, adipose tissue formation, and so on. Our previous studies and numerous reports from other researchers have revealed that the ascended expression of CTHRC1 tends to go hand in hand with tumorigenesis, proliferation, invasion and metastasis in various human malignancies through a series of molecular mechanisms and signaling pathways. However, the detailed pathogenic mechanisms of CTHRC1 overexpression in human malignant cancers are not yet clear. Here, we shall focus our description on the functions, expression profile in several representative malignant tumors and a number of molecular mechanisms and signaling pathways involved with CTHRC1. This introductory discussion of CTHRC1 will serve as a reference for further research in understanding this intriguing cancer-related protein. CTHRC1, identified as an oncogenic protein, was first discovered as a differentially expressed gene in animal models when researchers compared damaged blood vessels with normal rat arteries . This protein is a conserved 28-kDa secreted glycoprotein among vertebrates with 12 Gly-X-Y repeats in a short collagen motif. The human CTHRC1 possesses 92% amino acid sequence similar to the rat protein . CTHRC1 was originally detected to be transiently induced in injured arteries . Enhanced expression of CTHRC1 was proven to reverse collagen synthesis dramatically, improve cell migration in rat fibroblasts, smooth muscle cells, and increase neointimal formation to promote vascular and tissue repair process . Similarly, inhibiting collagen matrix deposition facilitated the underlying therapeutic value in anti-fibrotic therapy of keloids . Some ongoing studies showed that CTHRC1 expression was remarkably related to Hepatitis B virus (HBV) infection and increased expression of CTHRC1 helped HBV replication by several signaling cascades [4, 5]. In addition, some other studies have demonstrated that established liver fibrosis could be attenuated and reversed through promoting the expression of CTHRC1 [4, 6]. Empirical evidence also indicated that up-regulation of CTHRC1 served as a positive regulatory factor for bone formation and bone remodeling [7, 8]. Furthermore, CTHRC1 was detected in calcifying atherosclerotic plaques of human blood vessels . A recent study exhilaratingly elaborated the significant impacts of CTHRC1 in the regulation of adipose tissue formation, cellular glycogen levels, body composition, muscle function and physical activity [9, 10]. Interestingly, CTHRC1 is a secretory protein that has been regarded as a kind of meaningful circulating hormone for cell physiology and metabolism . Aberrant expression of CTHRC1, in particular, is ubiquitously associated with cancer proliferation, invasion, metastasis, clinical stages, tumor size, nodal metastasis, TNM pathologic stage and menopause. Thus, up-regulation of CTHRC1 was a positive indicator of poor prognosis in malignant tumor patients [11-15]. In previous reports, the tumor microenvironment of extracellular matrix (ECM) and epithelial-mesenchymal transition (EMT), which are significantly related to the aggressive feature of cancer cells [12, 16-18], has been suggested to be mediated by CTHRC1 [12, 15]. Excavated molecular biology characterizations reveal that the expression level of CTHRC1 significantly correlates with transforming growth factor-β (TGF-β1) and promoter demethylation [13, 19]. Furthermore, N-glycosylation may cooperate with canonical Wnt signaling pathways to intensify the overexpression of CTHRC1 and promote Oral squamous cell carcinoma (OSCC) metastasis . However, the potential mechanisms have not been illustrated perfectly. We have already published two articles in the journal Oncotarget, elucidating the association of aberrant expression of CTHRC1 with increased tumor invasion, metastasis and prognosis [11, 12]. In this review, we shall summarize almost all of the related functions known to have involved with CTHRC1 to identify the ubiquitous role of CTHRC1 in CTHRC1-associated tumors. A series of clinical studies have convincingly demonstrated that CTHRC1 protein and mRNA expression were ubiquitously detected in many human solid tumors , and that CTHRC1 overexpression in tumor cells increased the characteristics of malignant aggressiveness including increased tumor growth, invasion and metastasis. These researches have suggested that CTHRC1 may be developed as a potential crucial biomarker of poor outcome and a potential molecular target for anticancer therapies. Here, we would center our description on several representative malignant tumors and several molecular mechanisms to dilacerate the mask of this polyhedral cancer-related protein and to explore the underlying therapeutic targets in malignant cancer patients. Recent research has explored the aberrant up-regulation of CTHRC1 in NSCLC [11, 21, 22], Ke al el showed that overexpression of CTHRC1 increased NSCLC proliferation, invasion and metastasis in vitro via the Wnt/β-catenin signaling pathway . Based on this observation, paraffin-embedded immunohistochemical analysis of CTHRC1 in NSCLC patient tissues (212/292, 72.60%) illustrated that the up-regulated levels of both mRNA and protein were evidently higher than those in the paired adjacent non-cancerous tissues (6/66, 9.09%) (p<0.001). Likewise, western blot, RT-PCR and immunofluorescence analyses results indicated that the expression of CTHRC1 in five NSCLC cell lines (NCI-H226, NCl-H23, NCl-H820, NCl-H446 and A549) was markedly stronger than that of normal human lung epithelial cells (Beas-2Bs) . Two independent analyses using lung cancer specimens revealed that overexpression of CTHRC1 strikingly associated with differentiation degree, clinical stage, T classification, lymph node metastasis, distant metastasis and cigarette smoke as well as with poor clinical survival time of the patients compared with patient with low CTHRC1 expression [11, 21]. Furthermore, the observed results displayed that there were no significant differences between CTHRC1 and mRNA levels with different genders, ages or pathological types . Particularly, an ongoing study revealed that CTHRC1 interacted with microRNA-30b to decrease the ability of invasion and migration in NSCLC patients . These results suggest that CTHRC1 overexpression is a valuable prognosis biomarker for NSCLC. Similar to the NSCLC studies, CTHRC1 is a CRC-related protein that is differentially expressed between normal human tissues and tumor patient tissues . In a study, up-regulation of CTHRC1 increased the ability of invasiveness and proliferation in colon cancer cell lines and cancer cells. Comparing CTHRC1 with low and high-expression groups, the average recurrence rates were strongly different between low-expression (22%) and high-expression groups (44%) (p = 0.026) . Furthermore, researchers were surprised to discover that enhanced expression of CTHRC1 showed close relevance to peritoneal carcinomatosis (PC) and indicated poor prognosis in CRC patients . Moreover, CTHRC1 mediated matrix metalloproteinase 9 (MMP9) expression, which, during breakage from the border of the primary tumor, resulted in invasiveness and metastasis promotion [24-26], by activating ERK signaling pathway . In addition, Hypomethylation of DNA has been revealed to induce tumorigenesis through several mechanisms [27, 28], with increasing evidence suggesting that the frequent aberrant overexpression of CTHRC1 protein in colon cancer may be attributed to the exon 1 region demethylation of CTHRC1 gene . These data clearly elaborated that CTHRC1 overexpression is a promising prognostic biomarker of CRC progression associated with poor survival rate of the patients. CTHRC1 is up-regulated in EOC tissues and cell lines compared with borderline malignancy and benign tissue and normal ovarian epithelial cell lines . In order to investigate CTHRC1 expression profile and clinical and pathologic features in EOC, a recent article has suggested that CTHRC1 upregulation plays a crucial role to promote malignant cancer invasiveness and metastasis progression in EOC. Western blots and immunohistochemical results revealed that CTHRC1 expression was up-regulated in all eight pairs of fresh EOC tissues compared to that of their corresponding adjacent ovarian tissues. Additionally, another paraffin-embedded immunohistochemical analysis of CTHRC1 in 88 EOC patients' tissue specimens, compared with that in 17 ovarian borderline tissue specimens and 22 ovarian benign epithelial tissue specimens showed that CTHRC1 staining intensity gradually increased in accordance with malignancy: from benign, borderline, early stage to advanced stage (p < 0.001). Similar conclusions at the mRNA levels were observed by real-time PCR. Also, CTHRC1 was significantly stronger in EOC patients with a marked correlation with cancer size, menopause, clinical stage, lymphatic metastasis and poor free and overall survival of EOC patients. Collectively, these data indicated that there was no correlation of CTHRC1 up-regulation with age, tumor grades and tumor subtypes. Moreover, in a series of cell function assays involved in EOC cell lines, Hou et al demonstrated that CTHRC1 overexpression correlated with clinicopathologic characters including cell adhesion, proliferation, invasiveness, metastasis. Furthermore, these findings uncovered CTHRC1 up-expression leading to strong decline in the levels of E-cadherin, decreasing expression of E-cadherin as one of the prototypical biomarkers of EMT, through activating the signal pathway of Wnt/β-catenin. Coincident with these observations, this study has found that the activation level of Wnt/β-catenin signal and metastatic ability were decreased in EOC patients treated by Dkk1, a specific antagonist of Wnt/β-catenin signal . Interestingly, data also elucidated higher CTHRC1 protein levels in postmenopausal women compared with premenopausal women . Consistent with current study, the levels of CTHRC1 messenger RNA and genome expression information of transcripts were compared between PDAC and normal pancreas, results showed a statistically significant enhancement in PDAC tissue samples: 77% of pancreatic tumors (23 out of 30) suggested strong staining in the cell membrane and cytoplasm. Migration and adhesiveness function experiment of pancreatic cancer cells showed that, up-expression of CTHRC1 in pancreatic cancer cells can enhance the abilities of migration and adhesiveness. Oppositely, down-regulation of CTHRC1 in pancreatic cancer cell lines decreased cell adhesiveness and metastasis. In conclusion, overexpression of CTHRC1 in PDAC plays irreplaceable roles in the progression and invasion of this disease. Orthotopic xenograft tumor mouse models demonstrated the role of CTHRC1 could promote PDAC metastasis from primary location to distant organs, such as liver, spleen, stomach, colon and diaphragm. The incremental levels of CTHRC1 expression in PDAC led to strengthened adhesiveness and motility. In further investigation into the possible molecular mechanism of CTHRC1 involvement in the acceleration of cellular migration and adhesiveness, recent works have elaborated that CTHRC1 is required for regulating human pancreatic cancer cells growth and migration through a series of signaling molecules, such as the Wnt5a signaling cascade and Src-FAK signaling pathway . CTHRC1 gene was found to be commonly overexpressed in numerous types of human malignant cancers, such as invasive melanoma, thyroid, cervix, gastric cancer (GC), oral squamous cell carcinoma (OSCC), breast carcinomas, hepatocellular carcinoma (HCC), gastrointestinal tract cancer, dermatofibrosarcoma protuberans (DFSP), and so on [2, 4, 13, 19, 31-33]. The differential expression analysis of testicular, prostate and tracheal tumors showed no statistical significance . The observation of the frequent expression in DFSP and negative expression in dermatofibroma (DF) can be used as a label for the differential diagnosis of these two diseases . CTHRC1 acts as a tumor promoter in most of them. Overall, CTHRC1 overexpression is strongly correlated with cancer and is a promising target for cancer therapeutics. Primary function profile of CTHRC1. 1. Cancer-related protein, a valuable prognostic factor. 2. Reversing collagen synthesis, increasing the ability of cell migration. 3. Promoting vascular and tissue repair process. 4. Preventing fibrosis of liver and keloid. 5. Closely related to HBV replication. 6. Bone formation and bone remodeling. 7. Relevance with atherosclerosis. 8. Circulating hormone for metabolism and physiology. It has been reported that CTHRC1 is mainly regulated by TGF-β and BMP4 signaling pathways , and there is evidence showing that TGF-β signaling is involved in the occurrence and development of tumor [34-36]. Meanwhile, the inordinate TGF-β signaling activation has been found in many solid cancers. CTHRC1 mRNA and protein levels are enhanced in fibroblasts and chondrocytic cells in response to TGF-β family members , and there are many lines of evidence indicating that TGF-β regulates the expression level of CTHRC1 in a time- and concentration-dependent manner [3, 19]. As we know, TGF-β signaling pathway mediates multiple regulatory factors for vessel repair such as collagen type I and III. Nevertheless, it has been suggested that CTHRC1 could up-regulate in fibroblasts and smooth muscle cells of blood vessels, which indicates that CTHRC1 may has the ability to inhibit the deposition of collagen type I and III, which leads to the acceleration of cell migration in case of vascular remodeling [1, 38, 39]. Interestingly, promoter region of CTHRC1 has a binding site of Smads which is a downstream receptor of TGF-β/BMP4 pathways . Therefore, it is possible that the induction of CTHRC1 is partially due to the activation of TGF-β and BMP signaling pathways. BMP4 signaling pathway is similar to TGF-β, while the downstream cascade of BMP4 involves smad1/5/8 . In a word, TGF-β and BMP4 increase CTHRC1 transcription by regulating downstream transcription effectors mainly activated pho-Smads, which can bind to the promoter region of CTHRC1. While highly expressed CTHRC1 inhibits the activation of Smad in 293T cell line, it did not work in some other cell types . Consistent with this, Pyagay reported that the upregulation of CTHRC1 inhibited collagen deposition, mainly including collagen type I and Ⅲ, by impairing the phosphorylation activation of Smad2/3 which were the important components of TGF-β signaling [1, 42]. 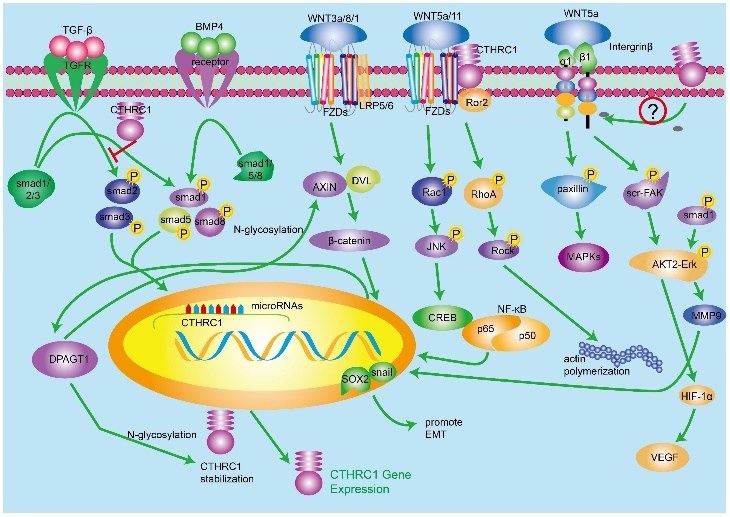 Beside this, understanding the complicated mechanisms between CTHRC1, composition of ECM and TGF-β signaling pathway requires further investigation. A number of studies have found that Wnt/β-catenin signaling pathway has complicated relationship with many other cellular signaling pathways, which indicates that Wnt/β-catenin signaling can be regulated by a mass of cellular molecules. The biological function of Wnt/β-catenin signaling pathway refers to cellular metabolism and the early pathogenesis and development of many human cancers [43-45]. In the presence of ligand Wnt3a/1/8, Wnt/β-catenin pathway will be activated, including Wnt-FZDs-Lrp5/6 complex which transduces signals to the cellular downstream and leads to accumulation of β-catenin in cytoplasm. The upregulated β-catenin translocates to nucleus and regulates a wide range of genes by binding to a series transcription factors such as TCF/LEF . There is scientific evidence suggesting that the biological effect of CTHRC1 on metastasis and proliferation of tumor cells is cross-linked with the canonical Wnt/β-catenin pathway. Several studies have investigated the interaction between CTHRC1 and Wnt/β-catenin pathway. In one article, luciferase assays demonstrated that expression of CTHRC1 was positively correlated with the transcriptional activity of β-catenin/TCF, and CTHRC1 had a positive relationship with cellular β-catenin . According to the research of Oral squamous cell carcinoma (OSCC), activated Wnt/β-catenin signaling upregulates the transcription of CTHRC1 by regulating the activity of β-catenin/TCF in the region of CTHRC1 promoter . At the same time, several studies have revealed that N-glycosylation protein DPAGT1 is connected with Wnt/β-catenin signaling . Studies also demonstrated that CTHRC1 expression can be up-regulated by DPAGT1/Wnt/β-catenin positive feedback loop. In conclusion, activated Wnt/β-catenin signaling pathway upregulates CTHRC1 expression and the DPAGT1/Wnt/β-catenin positive feedback loop enhances the function of regulating CTHRC1. While, it is not clear how CTHRC1 regulates Wnt/β-catenin signaling pathway. Because of the diversity of Wnt ligands and receptors, Wnt-FZD-coreceptor compound can activate alternate signaling pathway, which transduces cell signals in a different manner compared with classical Wnt/β-catenin signaling pathway. Here we introduce Wnt/PCP signaling pathway, one important noncanonical Wnt pathway. Wnt/PCP signaling pathway regulates planar cell polarity and related developmental events by activating downstream signaling molecules such as RhoA, Rac1, JNK and NLK [23, 47]. It has been proved that the activated RhoA and Rac1 cascades promote EMT by changing cell cytoskeleton . Yamamoto et al demonstrated in 2008 that cell-surface-anchored CTHRC1 was associated with Wnt/PCP signaling pathway through promoting and stabilizing the Wnt/Fzd/CTHRC1/Ror2 compound as a cofactor protein. In 293T cells, CTHRC1 stabilizes the interaction of Wnt5A-FZD-Ror2, and activates the Wnt/PCP pathway but not the Wnt/β-catenin signaling pathway . Subsequently, many experimental results are consistent with this opinion. One more thing worth mentioning is that the activated Wnt/PCP pathway increases CTHRC1 expression in turn. The above evidence indicates the relationship among CTHRC1, Wnt/β-catenin signaling pathway and Wnt/PCP signaling pathway is cross-linked. In hepatocellular carcinoma (HCC), knocking down of CTHRC1 can suppress cell migration and invasion force in HCC cells . To elucidate the mechanisms, the team performed a qRT-PCR array and the experiment result demonstrated that integrin β underwent great changes after the knock down of CTHRC1. It has been reported that integrin β2/β3 are related with tumor metastasis [51-57]. Integrins, composed by α- and β-subunits, are one type of transmembrane receptors. By binding to components in the ECM, integrins provide platform for a series of molecules, which can mediate multiple biological events including cell differentiation, adhesion, migration and cell survival [58-60]. It is worth noting that integrins can prevent anoikis, a kind of apoptosis [61, 62]. The downstream molecules of ligand-integrin β mainly contain the FAK kinase and Src cascades, which result in the activation of AKT2/ERK protein kinase. As mentioned above, the binding of CTHRC1 onto ligand Wnt5a stabilizes Wnt5a-FZD-CTHRC1-Ror2 compound, which attempts to activate paxillin and a series of kinase including MAPK, Erk and MEK [63, 64]. It has been proved that CTHRC1 could activate Src and Erk and the phosphorylated Src and Erk signaling cascades, which can promote tumor progression . There has been growing evidence showing that the activated ERK interacts with MMP9, which can down-regulate collagen deposition in the ECM and promote tumor metastasis, and finally increase pro-EMT transcription factor sox2 and snail . On the other hand, the phosphorylated AKT2/ERK could also promote the expression of HIF-1α which leads to high expression of VEGF, a key growth factor of tumor genesis and progression. However, how CTHRC1 regulates integrinβ remains to be further elucidated. Tumor suppressor P53 is a famous molecule which mediates the balance between proliferation and apoptosis by activating PTEN and p21. The uncontrolled proliferation of cancer cells is an important characteristics of tumor. There is evidence showing that CTHRC1 overexpression promotes cell proliferation [12, 66]. The investigation between P53 signaling pathway and CTHRC1 needs to be mentioned. HBV-activated CTHRC1 in HCC inhibits the expression of p53, activates AKT by inhibiting the activation of Forkhead box (FOXO) factors and finally downregulates the transactivation of p21 . However, the effect of HBV-activated CTHRC1 on p53 expression is not yet fully understood and further investigations will be required to determine if it's cell-type-specific. MicroRNAs can regulate several pathological conditions including cancer [67, 68]. Naturally, MMP9 and CTHRC1 are related with tumor metastasis according to previous and ongoing research of different types of solid cancers [13, 69]. According to recent findings, miR520d-5p can directly target CTHRC1. Subsequently, the level of phosphorylated ERK1/2 is reduced subsequently. Otherwise, transcription factor SP1 can transactivate miR520d-5p by binding to its upstream promoter region. In conclusion, SP1-associated microRNA-520d-5p can restrain tumor progression by targeting CTHRC1 in colorectal cancer patients. Bioinformatics analysis elucidated that miR-30b might bind to the 3′UTR region of CTHRC1 and the following result of dual-luciferase reporter assay strongly suggested that the expression of CTHRC1 was down-regulated by miR-30b through binding to 3′UTR . Recently, another paper reported that miR98 could also inhibit the metastasis and invasion of HCC through targeting CTHRC1 directly . Otherwise, MALAT-1, a long non-coding RNA, is also supposed to be related to metastasis and there are results suggesting that MALAT-1 gene silencing reduces cell motility through concomitant down-regulation of CTHRC1, HMMR, CCT4 and ROD1 . 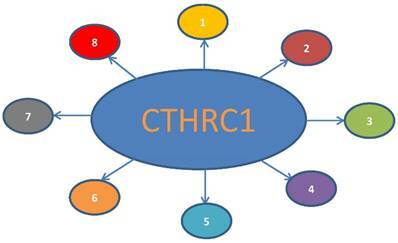 To date, there has been a decade of research on CTHRC1 since its original identification . CTHRC1 was known as a positive regulator involved in a variety of pathological and normal physiological processes such as anti-fibrosis, metabolism and physiology, tissue repair remodeling, osteoblastic bone formation, and cancer [1-3, 6-8, 10]. Notably, aberrant expression of CTHRC1 was found in different types of cancers, and its overexpression results in increased cancer cell proliferation, invasion and metastasis. CTHRC1 has been recognized as a promising diagnostic biomarker and precision medicine target for human malignant tumors and may play significant roles in different human malignant tumors. The TGF-β and BMP, Integrin β/src-Fak and ERK, P53 and Wnt signaling pathways have been elucidated to be closely related to the function of CTHRC1. Moreover, promoter demethylation and N-glycosylation also contribute to the protein expression of CTHRC1 in tumors [19, 20]. Nevertheless, it requires further studies to better understand whether the cellular localization and proteolytic processing, such as ubiquitination and phosphorylation, and nonresolving inflammation sustained activations are involved in CTHRC1 to promote tumor progression. Based on previous observation, the intersection between CTHRC1 and autoimmune is a new research direction in malignant cancers. However, further investigation is needed to clarify the polymorphism and detailed mechanisms of CTHRC1 in cancers. It is critical to elucidate how the complex molecular mechanisms of CTHRC1 impact cancer development and progression. There is a long path in front of us to put the CTHRC1 protein into clinical application. Additionally, increased evidence suggests that miR-520d-5p, miR-30b, Let-7b and miR-98 suppress tumor progression, invasion and migration in gastrointestinal tumors through combining CTHRC1 receptor [71, 73]. MiR-9 can attenuate Schwann cell migration through down-regulating CTHRC1 . The initial biochemical and functional characterization, how overproduced CTHRC1 decreases extracellular matrix synthesis and impacts the extracellular tumor microenvironment need further exploration at systems biological level. In summary, these related works mentioned above have made CTHRC1 a hot biomarker with much higher sensitivity, specificity, and accuracy for targeting various pathogenic diseases, including cancer. The role of CTHRC1 in multi-signaling pathways. 1. TGF-β and BMP4 regulate the expression of CTHRC1. CTHRC1 can inhibit the activation of Smad in 293T cell line. 2. Canonical Wnt/β-catenin signaling pathway and noncanonical Wnt/PCP pathways regulate the expression of CTHRC1 by mutiple transcription factors. DPAGT1/canonical Wnt positive feedback loop enhances the function of regulating CTHRC1. 3. The inner interaction between CTHRC1 and Integrin β/src-Fak/ERK/P53 signaling pathways is not clear so far. Corresponding author: Dr. ZunFu Ke, E-mail: kezunfucom.